The Enclave Games Team on March 29th 2019. We've been approached by Portal after they've taken their Neuroshima Hex game rights back from Big Daddy's Creations. We have green light to use Phaser as the game engine, and then build the native iOS and Android versions out of that using Electron. The game itself will be a single-player one consisting of (at least) four different campaigns. 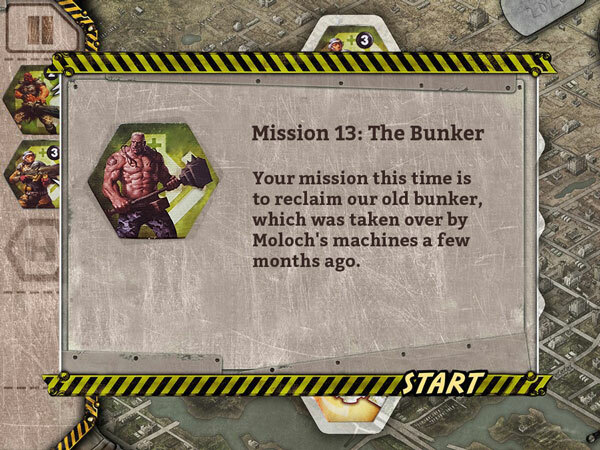 The player will lead the Outpost soldiers against Moloch in the first one, where the main task will be to infiltrate Moloch's factory and destroy it, prepare an ambush on the Moloch's convoy, or take back an old Outpost's bunker. The second campaign will include Steel Police fighting its way through Neojungle to save New York's General Grass from the steel hands of Smart. On the way back there will be a few extra surprises from the factions you wouldn't expect, like Hegemony. We have the first two campaigns fully playable already, but they still needs some polishing, especially balancing the difficulty level. The third one will be implemented in the next few weeks. We expect to have all four ready for open beta testing around the middle of May. The extra campaigns we have planned will probably be moved as an expansion, giving us more time to work on them, of course if the interest on the original release of Aftermath will be a success. The plan assumes releasing the base game in Q3 2019 and eventually following with the expansion right on Christmas.